I had the pleasure of interviewing Miki Sturges, a successful and proud Representative with doTERRA. doTERRA offers high quality Certified Pure Therapeutic Grade essential oils, Skin Care products, and Wellness Products that are necessary for every home. 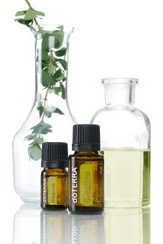 doTERRA also offers exciting work at home opportunity to introduce, educate and sell its products locally and globally with well-thought-out compensation and bonus plans. Miki Sturges: I am a stay-at-home, work-at-home mom of 3 boys, 14, 6 and 5... also a wife to a wonderful, hard-working husband living in beautiful CO. I came to US right after I graduated from college with English Literature degree in Japan, to further my education in English. My plan to return to Japan changed after I met my first husband and I am now fully an US citizen. I have worked in recruiting, HR and legal field in a corporate setting for many years but I really wanted to stay home with my children, so here I am. Besides taking care of my daily endless chores of laundry, cleaning, and cooking, I do a lot on-line in relation to my business, also I teach Japanese privately and volunteer at my son's kindergarten class. I love singing and am proud and fortunate enough to be a part of Western Colorado Chorale and Messiah Choral Society! and volunteer at my church as a praise team singer and a coordinator. Mikie Sturges: Actually, I was just sort of pushed into it. The opportunity presented itself and I took it. I learned about the power of essential oils afterwards and luckily I did not have to regret taking this chance! Though I knew this could be a hard one, I truly believe everyone can benefit from knowing alternatives to take care of our health. Essential oils have been used from ancient times, aromatherapy has been around for many years and known and proven for its benefits. I believe God has given us a body that has a power to heal and regenerate itself, also given us plants, trees, flowers, fruits, to be used for our benefits. Essential oils doTERRA offers are Certified Pure Therapeutic Grade that actually work on our cellular level strengthening whatever needed in our body. I love sharing with people what doTERRA can offer to help with their needs in such natural ways. Miki Sturges: I wanted to take care of my children when they are sick without feeling guilty for calling in sick, wanted to be there to pick them up from school and their everyday activities. Jennifer May: What would you say was your most difficult obstacle to overcome when building your business? Miki Sturges: Self-doubt is my obstacle, when you doubt yourself, you don't represent anything well. I've tried many other opportunities and got burned many times. I've lost some friends because of it sadly. For this reason, I have doubted my judgement on choosing business opportunities, hate asking my friends to support me in my business. To be honest, I am still struggling, but I know that the key is to be persistent and just keep moving forward instead of quitting. Especially now that I truly believe in the quality and integrity of doTERRA products - I have not felt this strongly about any other products I've tried before. To learn more about doTERRA and working from home with Miki CLICK HERE.